talking about timing, as he is in a car with speakerphone on, with a congresswoman also in the car as wife gets presidents call. pretty much it is haha your black husband had no choice but to enlist because he is black, and to bad he got killed but he signed up to be green beret and knew he could be killed. He is not a hero because a hero does not get killed (remember he told us McCain is not a hero because he was captured). And my kids are rich they do not have to be in the military.. My kids are the real heros for working with the russians making me more money. A widow with 2.5 kids in tears after the call "he didn't even remember his name..."
President Trump is facing criticism for how he has addressed the families of fallen soldiers, his treatment of John McCain and for new remarks about Obama. The Morning Joe panel discusses. President Trump told the widow of a Green Beret who died in Niger that the soldier “knew what he signed up for … but when it happens, it hurts anyway” during a phone call Tuesday. The widow of Army Sgt. La David Johnson received the five-minute call from Trump, Democratic Rep. Frederica Wilson told The Post, one day after the commander-in-chief falsely suggested that former President Barack Obama did not phone the families of fallen soldiers. Wilson said the widow, Myeshia Johnson, spoke to Trump for about five minutes and her only words were “Thank you” at the end of the conversation. Sgt. Johnson had been a member of a mentorship program started by the congresswoman. Donald Trump lied today and said Barack Obama didn't call the families of American soldiers killed in action. Then he was fact-checked in real-time. We have a family member who died in Afghanistan. OBAMA NEVER CALLED. HIS MOTHER RECEIVED A FORM LETTER. You are a scum Baja. Trump has a recording of his call. you completely missed the core issue here. 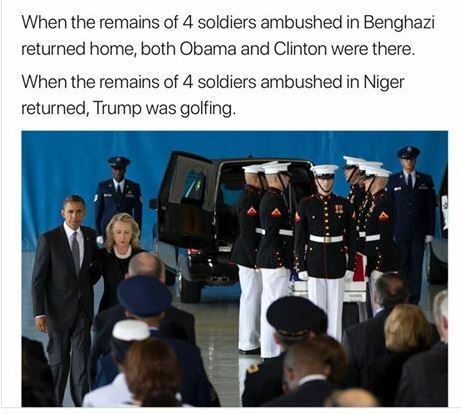 It was the rudeness to the widow of a hero that lost his life to top off his weeks of not caring and golfing more than any president in the history of the USA when he campaigned on Obama was playing too much gold. And he trump would be too busy at the white house. Born liar and chief. Sorry to hear of the part of the family that was not from trust fund money.... That side obviously deserves respect/condolences but for you not one bit trust fund boy. How many died under Bush? a war Bush did not support with the needed troops that he sent to Iraq... The Iraq war that was over lies. How many got called under Bush? Under trump how many servicemen have died for trump? Like these 4 boys. SO FAR? general Kelly should be arrested as assisting the enemy. First, he is such a moron as a general taking a hacked phone into top-secret meetings and in the white house that was used to listen into all those conversations. A head of homeland security can not be this stupid, the costs of counterintelligence damages here can hit billions of damages. Notice the trump whitehouse leaks are now minimal since his phone has been confiscated. Again this was a general we expect a brain not an idiot to have such positions dealing with national security. Now this dolt is doubling down on Trump's disrespect to a fallen soldiers widow. He claims that the friend of the family which happens to be a representative should not be listening in on a phone call that she had no control of being placed , it was just trumps carma that there were witnesses. Notice trump did not release the tapes. The widdow was upset over his call. She was heading to the airport where her husband's body was landed/arrived. Sounds like trump was not aware of that as generally, one would not want to disturb a person who had such an emotional place in time. This putrid non-human learning from trump decided to say that people grieving would want. F him, she wanted her friend the representative with her, the General could have been at the landing of the plane and joined her personally but he did not. Either did Trump. Again the moron general has no right to tell the widow of a serviceman who she can be with when grieving. He is a putrid human for his attempt to attack and insult this widow. What he did is not conduct of an officer attacking a widow as her husband's remains were returned. He should lose his pension and be fired. And not to mention his stupidity of allowing a hacked phone into top secret conversations. Wilson, who had known the soldier since childhood, was in the vehicle with Johnson and said she heard that part of the call on speaker phone. Trump insisted he said no such thing, but Kelly’s subsequent remarks told a very different story than Trump had pitched. The controversy over how Trump has conducted one of the most sacred of presidential tasks generated new turmoil in the White House. After one slain soldier's father accused the president of going back on a promise to send a check for $25,000, the White House said the money had been sent. The aunt of an Army sergeant killed in Niger, who raised the soldier as her son, said Wednesday that Trump had shown "disrespect" to the soldier's loved ones as he telephoned them to extend condolences as they drove to the Miami airport to receive his body. Sgt. La David Johnson was one of four American soldiers killed nearly two weeks ago; Trump called the families on Tuesday. Rep. Frederica Wilson, a Florida Democrat who was in the car with Johnson's family, said in an interview that Trump had told the widow that "you know that this could happen when you signed up for it ... but it still hurts." He also referred to Johnson as "your guy," Wilson said, which the congresswoman found insensitive. Cowanda Jones-Johnson, who raised the soldier from age 5 after his mother died, told The Associated Press on Wednesday that the Democratic congresswoman's account was correct. "Yes the statement is true," she said. "I was in the car and I heard the full conversation. "She was crying for the whole time," Wilson said. "And the worst part of it: When he hung up you know what she turned to me and said? She said he didn't even remember his name." AP found relatives of four soldiers who died overseas during Trump's presidency who said they never received calls from him. Relatives of three also said they did not get letters. Obama and George W. Bush — saddled with far more combat casualties than the roughly two dozen so far under Trump — did not call all those soldiers' families, either, but both did take steps to write, call or meet bereaved military families. Chris Baldridge, the father of Army Cpl. Dillon Baldridge who was killed in June in Afghanistan, told The Washington Post that when Trump called him, he offered him $25,000 and said he would direct his staff to establish an online fundraiser for the family. But Baldridge said it didn't happen. General Kelly should be removed for lying about a representative. Too friggen bad she was not in the house when it happened and this time there is a tape. the recording showed no such statements. The general is a liar like trump... He should immediately resign and forfit all pensions and ranks for conduct unbecoming an officer. Washington (CNN)White House chief of staff Gen. John Kelly on Thursday erroneously claimed that Rep. Frederica Wilson, D-Florida, claimed credit for securing "$20 million" in federal funding to build a new FBI field office in Miami in 2015, according to a video of the dedication ceremony posted Friday by the Sun Sentinel. Accusing her of being an "empty barrel," Kelly said Wilson focused more on her own actions than the heroism of the two FBI agents for whom the new building had been named. While Wilson took credit in her speech at the dedication ceremony for shepherding legislation naming the FBI building after two FBI agents who were killed in a 1986 gunfight, she did not claim credit for helping to fund the building, according to the video. Wilson also spent a considerable portion of her remarks praising the valor of law enforcement, retelling the story of the two slain FBI agents and calling on those who work in the field to stand and be recognized. The White House did not directly respond to the video that contradicts the chief of staff's claims, and instead repeated Kelly's criticism of Wilson as "an empty barrel." wholly crap other people were listening in to the conversation, trump et al right wing media, a general said this was taboo. where is the right wing outrage? this also shows the general is a piece of lying sack of shiite. He told us he had to counsel the president for the call in question where he made a call months before for the first death on his watch. That general needs to be fired for all these lies. Idiot. What he meant was that the soldier signed up knowing the risks ... IOW, he is a hero in every sense of the word. My GOD but you Trump-haters can and do twist everything about the man, the GOP, and the military to insane extremes.